With Three Weeks To Go, Michigan’s 2018 Races For The U.S. House Stand Out When It Comes To The Amount Of Money They’re Attracting. LANSING (OCT. 16, 2018) — There are still three weeks remaining until Election Day. But already, Michigan’s 2018 U.S. House races have broken records. 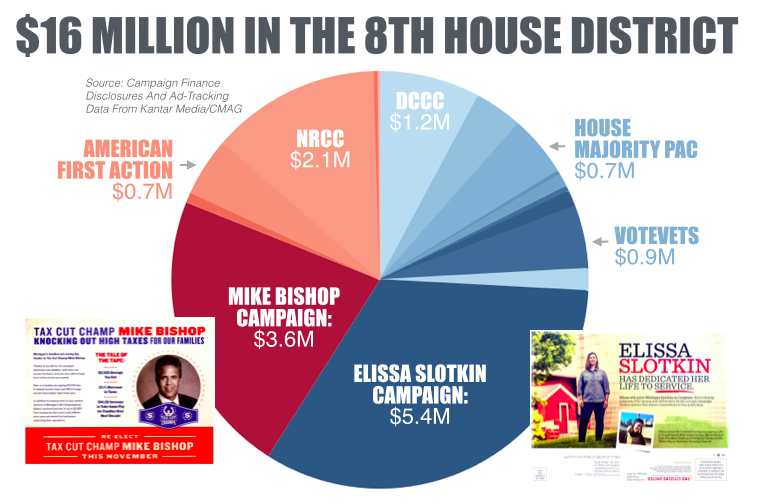 According to a new analysis of disclosures, a race in the 8th Congressional District between Rep. Mike Bishop, a Republican from Rochester, and Democrat Elissa Slotkin, of Holly, is the most expensive U.S. House contest Michigan has ever seen. 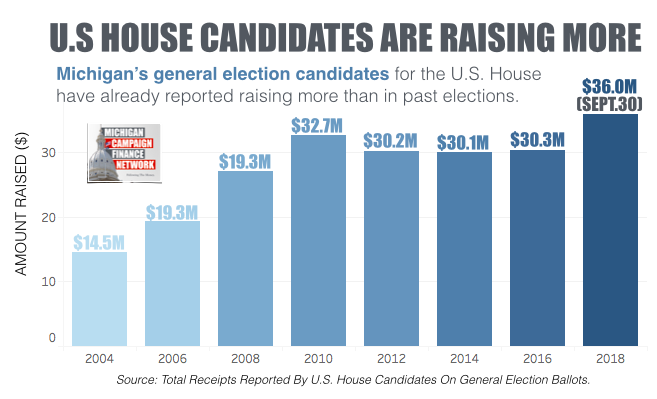 On top of that, Michigan’s general election candidates for the U.S. House have already reported raising more money — about $36 million total — than they’ve ever raised in a two-year election cycle. The previous high was $32.7 million in the 2010 election. The new disclosures cover only through the end of September, leaving a month of fundraising before the Nov. 6 election. The candidates’ fundraising numbers and the spending of outside groups show that money is pouring into Michigan’s U.S. House races this year as Republicans fight to hold onto seats that have been in their hands for a decade and Democrats benefit from energy among their donors nationally. Candidates for Congress had to release new fundraising reports on Monday. MCFN has created a spreadsheet with key numbers from the new disclosures and a look at some of the top donors. The following is a summary of the U.S. House races attracting the most money so far in Michigan and where some of the money is coming from. The 2018 battle in the 8th District is going to shatter the record for the most expensive U.S. House race in Michigan history. The record of about $14.2 million has stood since 2010 when Rep. Mark Schauer, a Democrat, lost his 7th District seat to former Rep. Tim Walberg, a Republican. That $14.2-million number is based on candidate fundraising by the two general election candidates and outside spending meant to influence the race. MCFN has already tallied about $16.5 million in the 2018 8th District race, including $7.4 million in outside spending. The candidates, Bishop and Slotkin, have reported raising $3.6 million and $5.4 million respectively. Slotkin has raised the most money of any U.S. House candidate in Michigan this election cycle. VoteVets describes itself as a “progressive political organization.” And the House Majority PAC is a super PAC that supports Democratic House candidates across the country. The top pro-Bishop outside spenders in the race have been the National Republican Congressional Committee ($2.1 million) and American First Action ($759,000). America First Action is a super PAC that works to support the agenda of President Donald Trump. The race in the Oakland County-based 11th District will likely also be among the most expensive Michigan has seen this decade. The seat is currently held by Rep. David Trott, a Republican from Birmingham, who decided not to seek re-election. Republican Lena Epstein, of Troy, and Democrat Haley Stevens, of Birmingham, survived crowded primaries to face off in November. Epstein’s campaign has raised $2.1 million for the election cycle. Epstein has given her own campaign $990,100, according to campaign finance records. Stevens’ campaign has raised $2.9 million. The outside spending in the general election has totaled about $3.4 million so far. Those numbers show that the race has attracted about $8.5 million for the general election. When you factor in the money in both sides’ crowded primary races, the race has attracted about $13 million overall. The biggest outside group helping Epstein is America First Action, which has spent about $742,000 in opposition to Stevens so far. In support of Stevens, the Democratic Congressional Campaign Committee has spent about $730,000 and the Independence USA PAC has spent about $641,000. The Independence USA PAC is a super PAC created by former New York City Mayor Michael Bloomberg. The other Michigan race seeing heavy outside spending is southwest Michigan’s 6th District, where Rep. Fred Upton, a Republican from St. Joseph, is seeking re-election. Upton has reported raising $2.8 million for his campaign while Democrat Matt Longjohn, of Portage, has reported raising $1.1 million. The American Hospital Association has spent about $257,000 in support of Upton. A group called ClearPath Action Inc. has spent $125,000 in support of Upton, and Defending Main Street has spent $110,000 in support of him. ClearPath Action works to “accelerate conservative clean energy solutions,” according to its website. Defending Main Street says it’s a super PAC that supports “the governing wing of the Republican Party,” according to its website. Another group, Michigan Families for Economic Prosperity, a nonprofit, spent about $259,000 running ads critical of Upton earlier this year, according to MCFN’s analysis of Kantar Media/CMAG ad-tracking data.